Since today a new scale is used. After few months of tests and evaluation with some users I’m using a new scale wich supposed to reflect propagation below normal (disturbed) in a more accurate way. Thoses situations were probably underestimate. I’m still looking forward your comment. This entry was posted in Site news, tropospheric forecast and tagged ducting, microwave, propagation, tropospheric forecast, vhf on August 9, 2016 by f5len. slightly different from the previous maps cover from D4/EA8 to caribbean sea. This entry was posted in Site news and tagged atlantic, beacon, caribbean sea, propagation, tropospheric forecast, vhf on June 8, 2016 by f5len. Suggested by Phil FR5DN, a new map covering path from ZS to FR/3B8 is available. 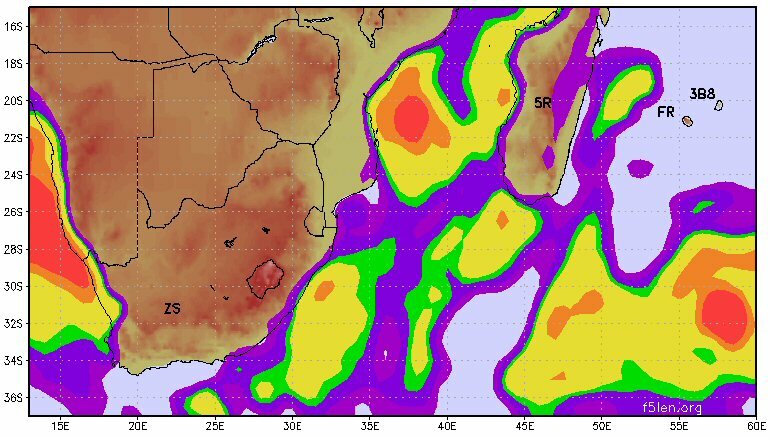 This entry was posted in tropospheric forecast and tagged forecast, propagation, south africa, tropo, Tropospferic on October 30, 2015 by f5len. I use now datas from ARPEGE model from Météo France. Height resolution is better with more surface levels in the range 2m to 1500m. Horizontal resolution is 7,5 km for Europe and 36 km for Pacific area. Time forecast up to 102 hours. Still need some adjustments on my side but good new source of data. At this time only Europe area is computed. But the other areas will be soon available. This entry was posted in Site news, tropospheric forecast and tagged ducting, microwave, propagation, tropospheric forecast, vhf on August 5, 2015 by f5len.